Miles of smiles for riders of all styles. As we head into our 15th year as an online magazine and event company, the time has come to let our readers know what the plans are, event-wise, here. We’re going to mix it up a little this year. Dates change, locations change and how certain events are run will change. In chronological order, here’s what you can look forward to this year. Grab your calendar and save the dates. This winter grand tour provides riders with a reason to hit the road on those not-often-enough sunny days that strike now and then in the Northwest. Riders are provided a list of 30 plus island locations found in the Puget Sound and off the west coast of Canada. All islands are accessible by motorcycle. Some you’ve heard of and some you probably haven’t. Those getting photographed on 10 or more receive a special plaque to commemorate the experience. 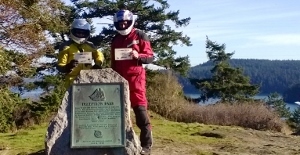 Above: Jim and Ellen Palms document their visit to Pass Island, one of six they hit in a single day of riding in early January. Since 2001, Sound RIDER! has brought together an exhibit of unique bikes from around the Pacific Northwest. There are no boundaries as the exhibit brings together cruisers, dual sports, sport bikes, salt flat racers, restorations, classic, one-offs and much more. Incidentally, if you have a bike you'd like to show, complete the short form at the weblink below. Good Food and good riding is what the Café to Café Grand Tour is all about. Registered riders get a list of 15 cafes scattered throughout the Pacific Northwest. The goal is to get to each one over a seven month period and document yourself by way of a photo. Anyone reaching all 15, over the seven month period, receives a personalized certificate of completion to hang up at home, in the office or right next to the bike. Each year we run a road trip tour over a five day period, somewhere in the Pacific Northwest, exploring the sites and roads. Evenings are a time to enjoy dinner together and share stories and lies. This year’s tour goes through Canada exploring the 10 best roads over a seven day period. But because the weather in Canada is unpredictable, even in summer, those interested need only register for a single tour package and hit the road at their leisure. A social media page will be developed so riders can synchronize their plans with others, if they so desire. Now in its sixth year, this highly anticipated event takes riders on a five day route somewhere through the Pacific Northwest. In 2009, well before there was ever a Washington Backcountry Discovery Route of record, we carved our way from Stevenson, Washington to the Canadian border. This year we’ll reverse that ride and throw in a few alternates, for good measure. Our routes are designed to be enjoyed by all and expert skills are not required. After 11 years of being held on the west end of the Columbia River Gorge, we’re moving the event into the heart of the Cascades. The 2014 Rally in the Gorge will be held at the Hood River Fairgrounds in Oregon. The focus remains on sport bike, sport touring, dual sport and adventure riders and as always, there will be informative speakers and clinics focused on each. A date change to Labor Day weekend provides riders a chance to join in who have not been able to in the past. All event websites will be updated in February. If you’re not a Sound RIDER! subscriber, use the link at the top of the page to sign up now, so you hear about changes as they happen.